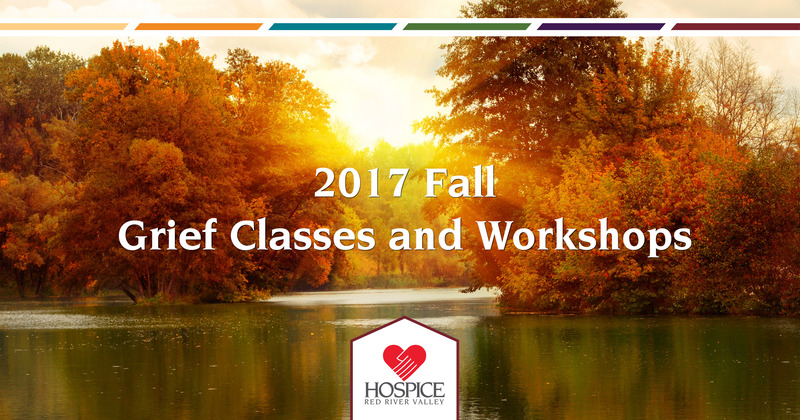 This fall Hospice of the Red River Valley is offering free educational workshops for adults and youth who have recently experienced the death of a loved one. Youth Journeys is a day-long program for youth, ages 6 to 18, who have lost a loved one. The day is broken down into sections, allowing youth a chance to explore how the death of their loved one has affected their lives, their feelings, self-care and how to embrace memories. Youth will have an opportunity to meet our pet therapy dogs. The day ends with a celebration of life service. Parents/guardians are also required to attend a portion of the day. Food and snacks are provided throughout the day. When a friend loses a loved one through death, we struggle to know what to do. Working through grief involves accepting the loss, experiencing the pain of that loss and creating a different bond or relationship with the person you have lost. This presentation offers attendees ways to help a friend who has experienced the loss of a loved one. Transitions: Beyond Widowhood is a five-session class for men and women who wish to address the more practical aspects of widowhood. This class is not intended for those widowed less than one year. Discussion topics include maintaining emotional and physical health, home maintenance, making connections, dating and financial planning. Pre-screening and pre-registration are required. The registration fee is $25 per person. Scholarships are available. Managing grief in times of celebration can be overwhelming. Suffering the loss of a loved one is difficult any time of the year, but the holiday season can intensify feelings of loss. This presentation will enable attendees to identify and learn how to manage the mixed and painful emotions that can surface when grieving during the holidays. Participants will also learn important self-care strategies. This class is free and open to the public, no pre-registration is required. Registration is required for some classes because space is limited. We are committed to making educational and support opportunities available to our communities. To register for classes, call (800) 237-4629 and ask for the bereavement department. All classes except Beyond Widowhood ($25 fee, scholarships are available) are FREE of charge; however, donations are always welcome to help offset the costs involved.